Bladder augmentation is surgery to make the bladder larger and improve its ability to stretch. After surgery, your bladder should be able to hold more urine. After surgery, you may feel weak and tired at first. You will probably feel some pain or cramping in your lower belly and need pain medicine for a week or two. You will have a tube coming out of the cut the doctor made (incision) in your skin just above the pubic bone. This is called a suprapubic catheter. 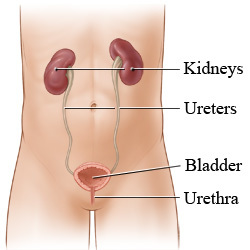 You also may have a catheter in your urethra, which is the tube that carries urine from the bladder to outside your body. These catheters will drain urine and mucus from your bladder for the first few weeks after surgery. Your doctor will do a test to check the strength of your bladder about 2 or 3 weeks after surgery. Once your doctor has made sure that there are no leaks in your bladder, he or she will take out the catheters. You will probably be able to go back to work and most of your usual activities in 4 to 6 weeks. But you may need up to 3 months to fully recover. Try to avoid heavy lifting and strenuous activities that might put extra pressure on your bladder while you recover. After the catheters are removed, you may have trouble emptying your bladder. If this happens, you will need to put a tube into the opening where urine comes out (urethra) to drain urine from your bladder. Some people only need to do this for a short time after surgery. But others may have to use a tube to drain their bladder permanently. Avoid strenuous activities, such as bicycle riding, jogging, weight lifting, or aerobic exercise, for 6 to 8 weeks or until your doctor says it is okay. For 6 to 8 weeks or until your doctor says it is okay, avoid lifting anything that would make you strain. This may include a child, heavy grocery bags and milk containers, a heavy briefcase or backpack, cat litter or dog food bags, or a vacuum cleaner. You may shower as usual. Pat the cut (incision) dry. Do not take a bath until your doctor tells you it is okay. If your doctor has told you to flush your bladder, follow his or her instructions on how to do this. Your catheters are not draining urine, even after you flush your bladder. You have clots of blood in your urine. You have new or worse pain when you urinate. Enter A520 in the search box to learn more about "Bladder Augmentation: What to Expect at Home".